15/09/2012 - Riccardo Agostini has been uncatchable on the 4 kilometers and 85 meters of the circuit of Vallelunga. 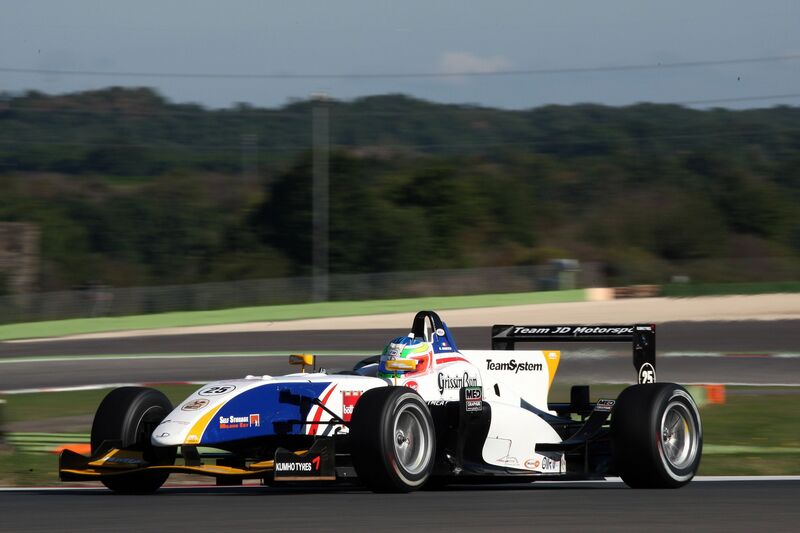 The driver from Padova racing on the JD Motorsport's Mygale set the pole position of both races. This is a very good chance to recover some points lost in Imola after the disqualification of Imola and the 10 points penalty. The home driver Eddie Cheever was two tenths slower than the quickest time set by Agostini in 1'30''238 and will try to keep the classification lead. Third was the other Prema Powerteam driver, Brandon Maisano, who set his quickest time in 1'30''605, three tenths shy of the leader. Fourth place for Kevin Giovesi (Ghinzani) who confirmed to be in good shape after the double victory of Imola. The Milanese did not take part in the wet free practice yesterday to avoid taking useless risks as sun shines today on the circuit named after Piero Taruffi and the circuit is completely dry. Fifth position in race one for Henrique Martins. The Brazilian was 8 tenths slower than Agostini and proceeded the other JD Motorsport's driver, Nicholas Latifi. The Canadian had a good qualifying and resulted less than a second slower than his team mate. The seventh place on the grid will be occupied by Sergey Sirotkin (Euronova) who set his best time in 1'31''306, ahead of Ghinzani's, Robert Visoiu and of team BVM's Mario Marasca. The grid will be closed by Michael Heche, who produced a good session and was 1.7 seconds shy of the leader in his first race in Formula 3 on the BVM's Dallara, and Yoshitaka Kuroda (Euronova), who had an excursion that compromised his second qualifying. In race two, Kevin Giovesi will line up behind the JD Motorsport's driver, who set the quickest time in 1'30''161, as he was 86 thousands slower than Agostini. Eddie Cheever's time was a tenth slower instead and he will open the second row tomorrow morning. The Roman driver will be sided by his team mate Brandon Maisano, a less than a tenth from Cheever's time. The Brazilian driving for Prema Powerteam, Henrique Martins, was three tenths from the pole position who will have Mario Marasca (BVM) at his side in third row. The fourth row will come from the east as the Moscow driver Sergey Sirotkin proceeded by a bit more than a tenth the Romanian driving for Ghinzani, Robert Visoiu. Nicholas Latifi was 1.005 seconds slower than the pole in eighth as was a tenth faster than Michael Heche (BVM). Kuroda will start from the last spot of the grid instead as he did not set any time in the second qualifying.